Having the right magazine with you at the range makes all the difference since it allows you to spend time Shooting instead of wasting time reloading. 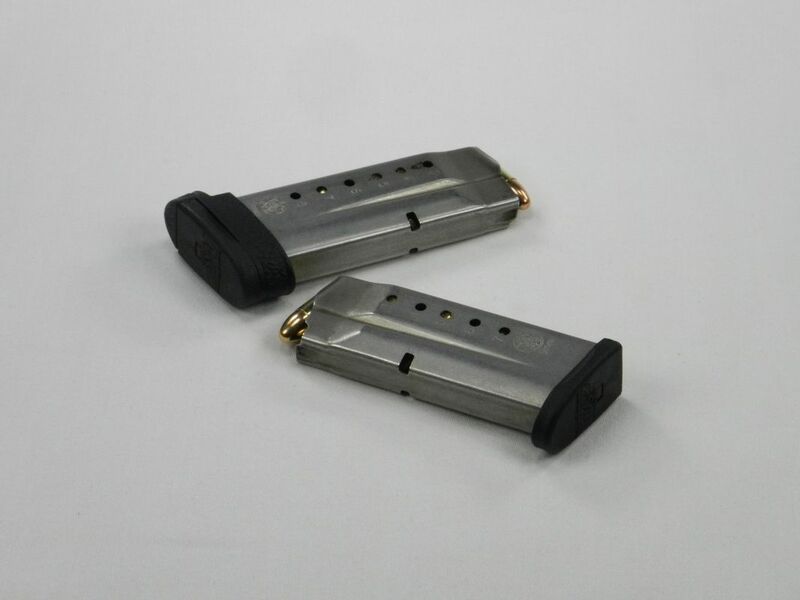 Magazines for the 9mm Smith & Wesson M&P Shield & Shield 2.0 come in both 7 and 8 round variants. The criteria that we use to evaluate magazines for small handguns are: 1) is it from the original gun manufacturer, 2) capacity, 3) condition – if it is used and 4) price. Since the Shield is a relatively new firearm all of the magazines that we have were manufactured by S&W. 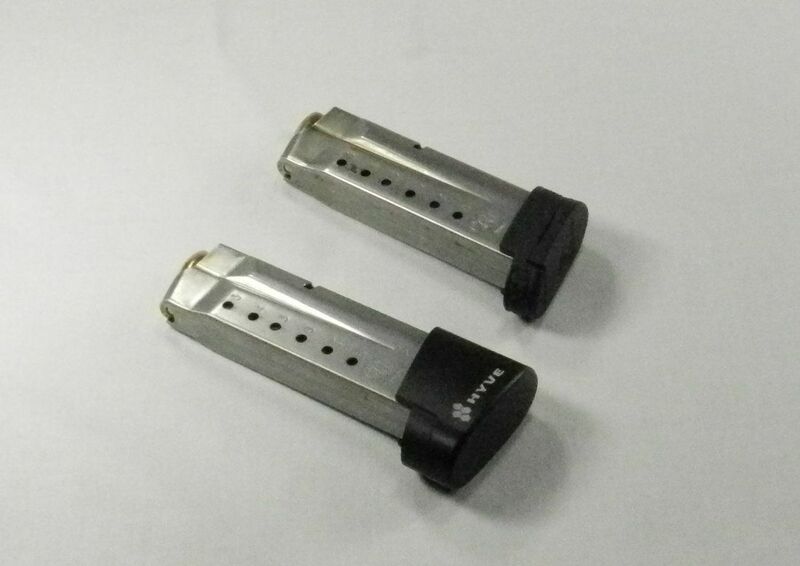 We have a variety of both 7 and 8 round magazines since the 8 round magazines have a small extension (e.g. 1 finger tall) that makes the firearm a more stable shooting platform and therefore more accurate – but the 7 round magazine makes the firearm more concealable. You can buy these magazines at smith-wesson.com or your local gun shop. For normal every day carry, and USPSA type shooting, we use a 9mm Smith & Wesson M&P Shield for a variety of reasons. But one of the features that makes it a great mid-sized carry gun also limits its capacity; the magazine size. In the stock 9mm Shield you can get both 7 and 8 round magazines. But when the number of rounds counts it would be nice to have a few more. Of course one of the solutions is to carry spare magazines. But now there is also another option – a 2 round magazine extension for the 8 round Shield magazine built by Hyve technologies. The Hyve extension replaces the footplate on the stock 8 round magazine and increases its capacity to 10 rounds while retaining the lines of the Shield’s grip. The extension is machined from anodized aluminum and comes in either black or 6 other colors to fit your preference. In addition to manufacturing extensions for the 9mm Shield, Hyve is also currently making extensions for the .40 and .45 caliber Shields and for the Glock 19, 23, 26, 27, 33, 36, 42 and 43. 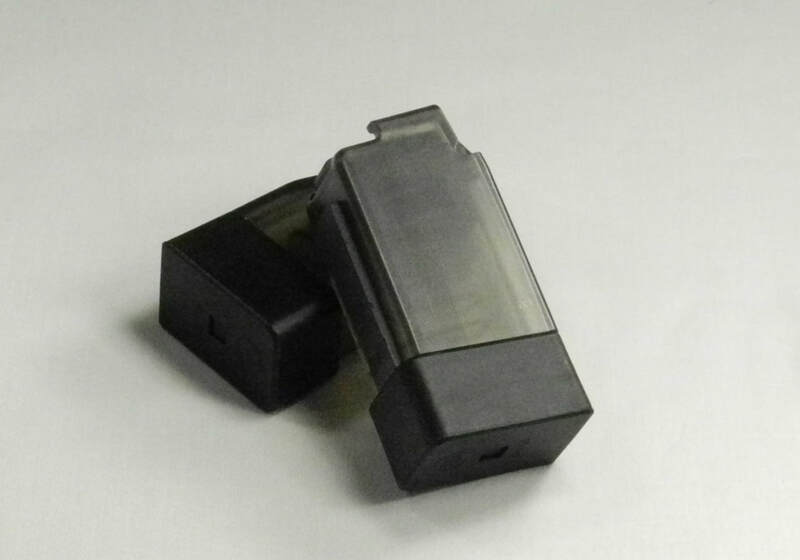 You can buy these Shield magazine extenders at the Hyve Technologies website or potentially at your local gun shop. 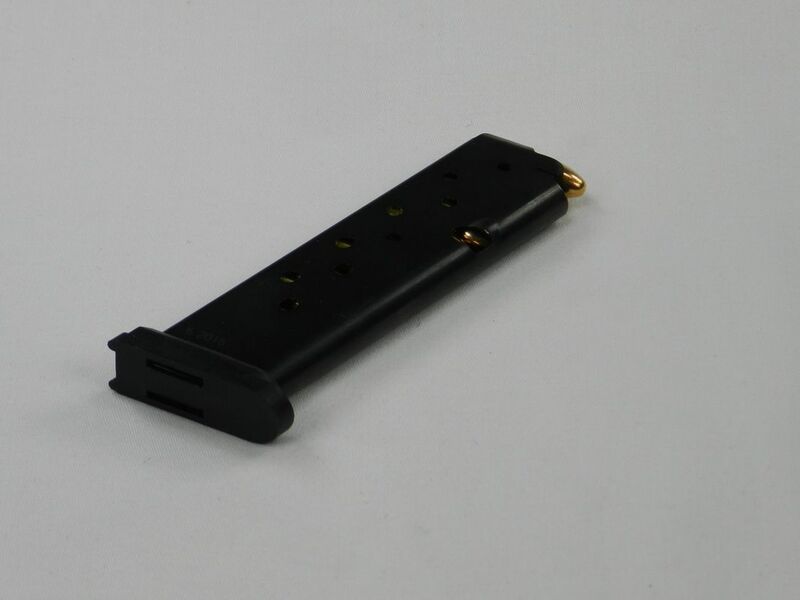 ​Note: We have 4 of the Hyve +2 Magazine extensions for our 9mm Shield. We’ve used them for a couple of years and they’ve always worked great. When we purchased the 9mm Shield 2.0 with the integrated Green Crimson Trace laser none of the magazines with the Hyve extensions would latch into the magazine well of the new 2.0 firearm; even though the stock S&W 7 and 8 round magazines were totally interchangeable. As far as we know the 9mm Shield 2.0 with the integrated Green Crimson Trace laser has exactly the same frame as the normal 9mm Shield 2.0 – it just adds the Crimson Trace laser to the front of the firearm. The guys at Hyve confirmed that the Hyve extension is supposed to work in the 9mm 2.0 Shield frame with no issue. 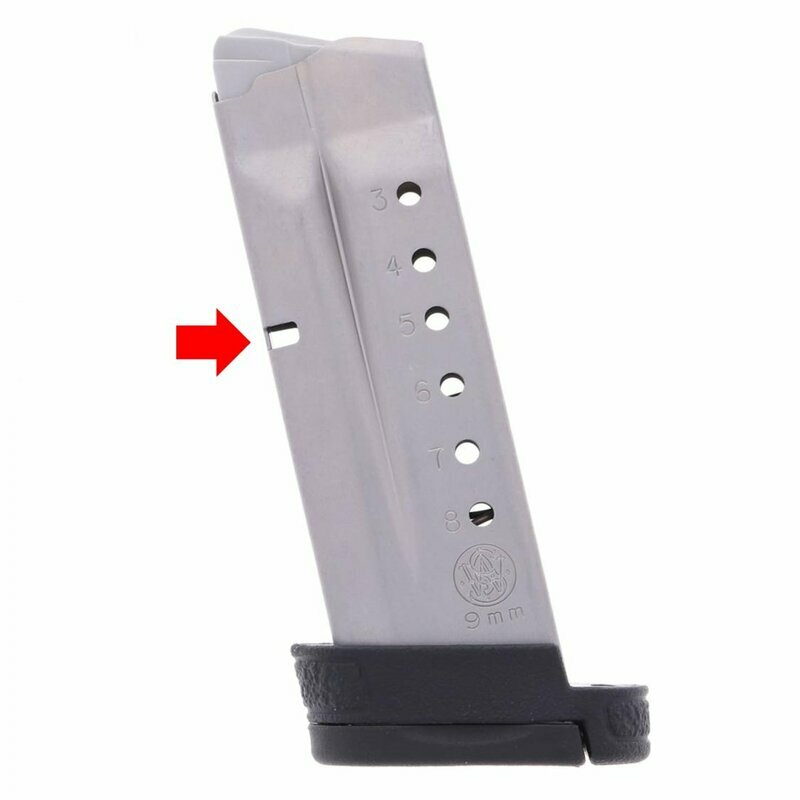 Upon detailed inspection the reason that the 8+2 Hyve extended Shield 1.0 magazines did not latch into the 2.0 Shield’s magazine well was because the cut-out on the magazine did not completely align with the magazine catch/release for the 2.0 on the bottom side. This impeded the catch from sliding into the magazine cutout and latching. To solve this issue, I took a file and slightly filed down the lower edge of the 9mm magazine cutout (~30 to 40 strokes with a moderate metal file) on both sides of the magazine. Once I had done that, the 8+2 Hyve extended (Shield 1.0) magazines latched into the 2.0 firearm – without being noticeably looser in the 1.0 firearm. Magazines for the 9mm Beretta 92FS come in 10, 15 and 17 round variants. The criteria that we use to evaluate magazines for large handguns are: 1) is it from the original gun manufacturer, 2) capacity, 3) condition – if it is used and 4) price. Since we purchased our 92FS prior to 1994 all of the magazines that we have are 15 round pre-ban variants manufactured by Beretta so that there is no confusion as to how the firearm is loaded. You can buy these magazines at midwayusa.com or your local gun shop. 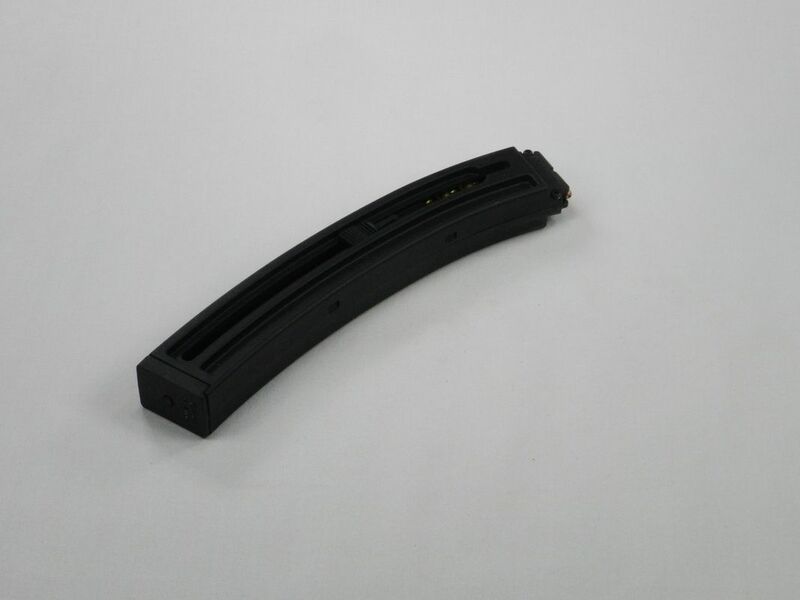 Magazines for the .22 caliber Walther H&K MP5 A5 come in both 10 and 25 round variants. The criteria that we use to evaluate magazines for small caliber carbines are: 1) is it from the original gun manufacturer, 2) capacity, 3) condition – if it is used and 4) price. Because we live in a State that has kept the 1994 Assault weapons ban in place, and there are no pre-ban magazines that fit this firearm, all of our magazines are 10 round magazines manufactured by Walther. You might be able to buy these magazines at your local gun shop, but more likely you will need to go to vizardsgunsandammo.com. 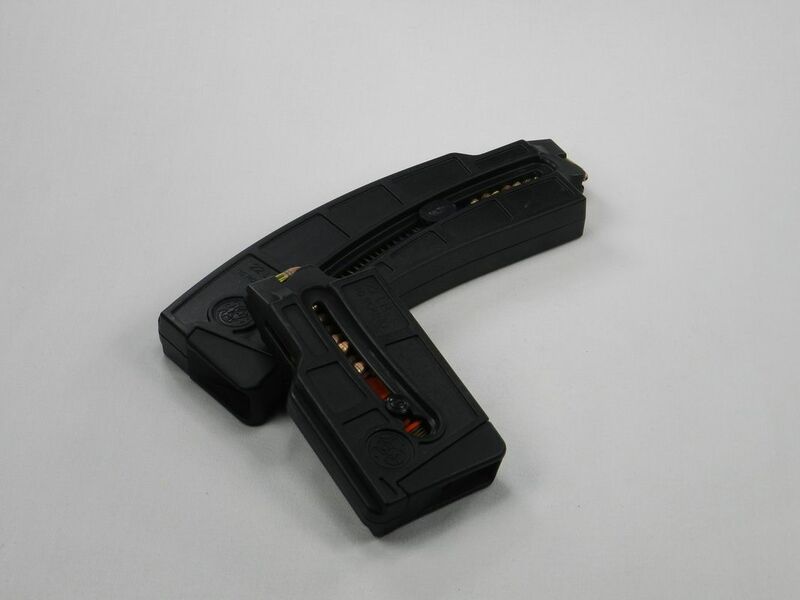 Magazines for the 9mm IMI Uzi come in 20, 25, 32, 40 and 50 round variants. The criteria that we use to evaluate magazines for folding stock pistol caliber carbines are: 1) is it from the original gun manufacturer, 2) capacity, 3) condition – if it is used and 4) price. 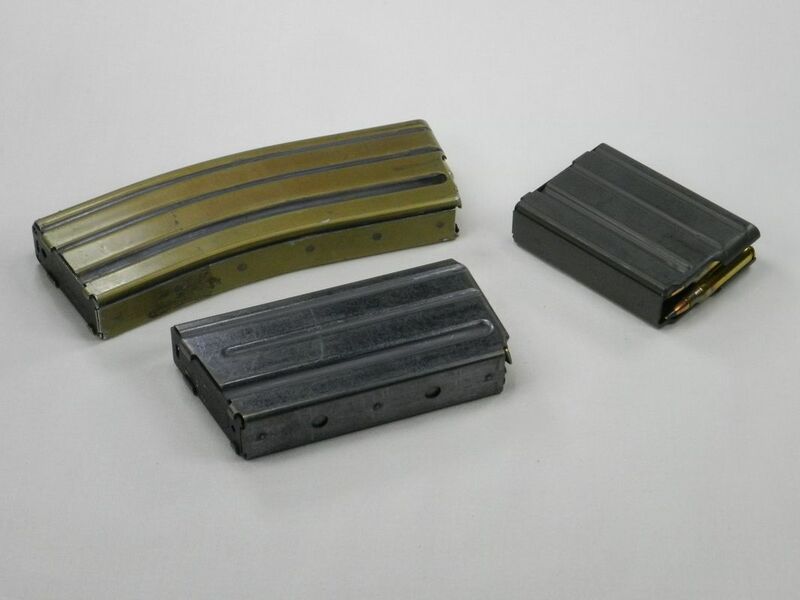 Although we live in a State that has kept the 1994 Assault weapons ban in place, since there are pre-ban magazines that fit this firearm, we have a variety of 25 and 32 round pre-ban magazines manufactured by IMI. You might be able to buy these magazines at your local gun shop, but more likely you will need to go to robertrtg.com. 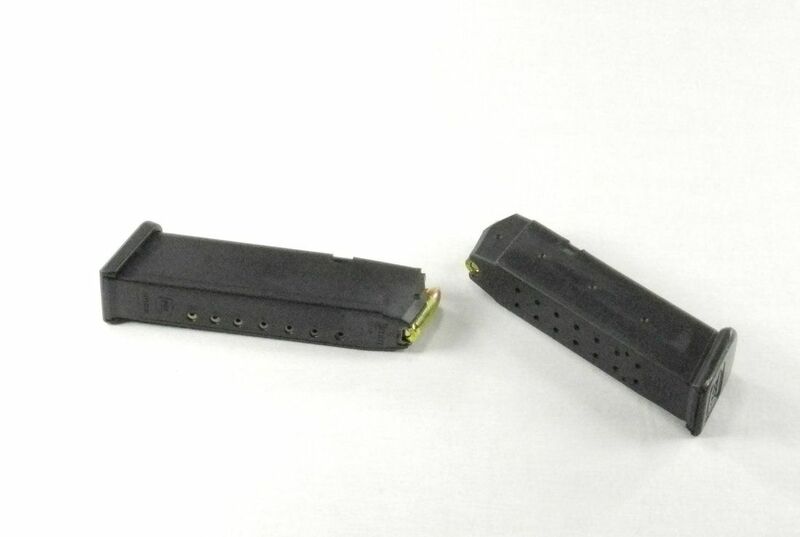 Traditionally the recommended magazines for the 9mm Hi-Point 995TS carbine only came in a 10 round variant. However. 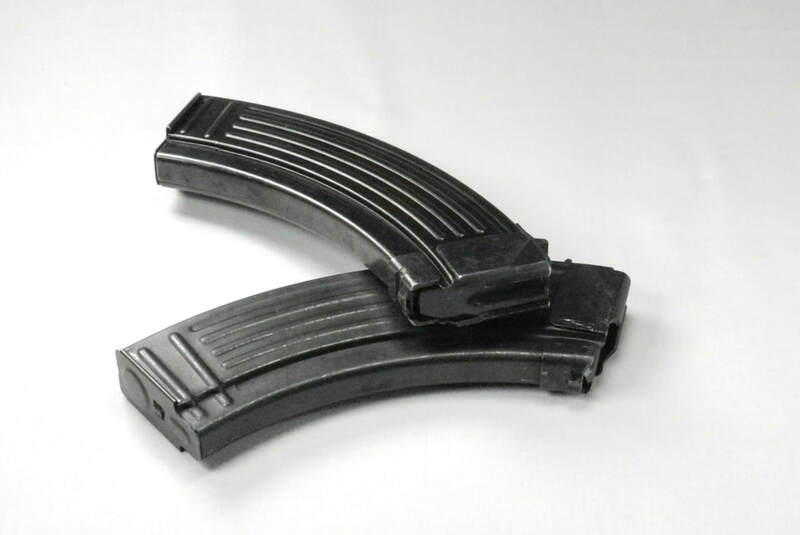 You could purchase 15 round magazines made from other manufacturers - but using them would void the manufacturer’s warranty (if that matters to you). However, Hi-Point just announced a new 20 round “Red Ball” magazine. The criteria that we use to evaluate magazines for short range pistol caliber carbines are: 1) is it from the original gun manufacturer, 2) capacity, 3) condition – if it is used and 4) price. All of the magazines that we have are 10 round variants manufactured by Hi-Point since the firearm seems to perform much better with stock magazines. You should be able to buy these magazines at your local gun shop, or you can go to hi-pointfirearms.net. 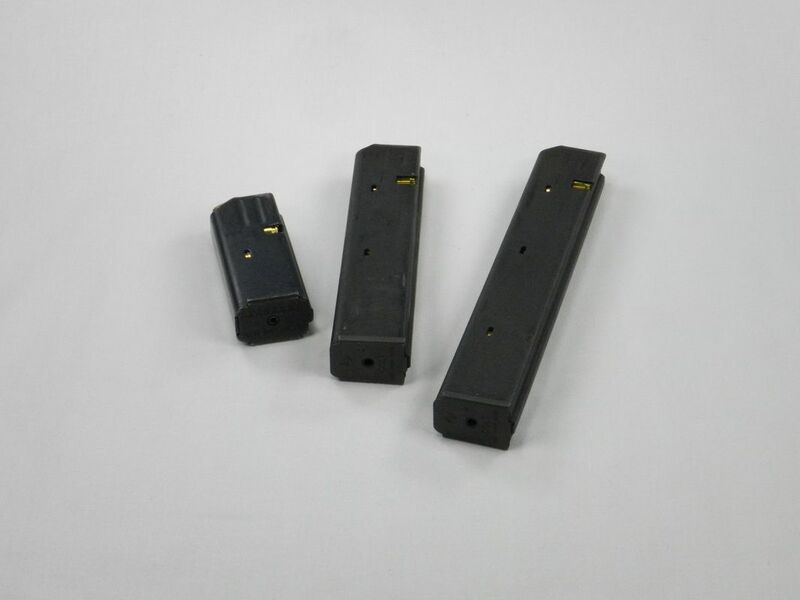 Magazines for the 9mm Coharie Arms CA94 come in 10, 15, 20, 30 and 40 round variants since it is an HK94/MP5 clone. The criteria that we use to evaluate magazines for pistol caliber carbines are: 1) is it from the original gun manufacturer, 2) capacity, 3) condition – if it is used and 4) price. Although we live in a State that has kept the 1994 Assault weapons ban in place, since there are pre-ban magazines that fit this firearm, we use 25 round pre-ban magazines manufactured by HK - both the original straight magazines and the second generation curved magazines. 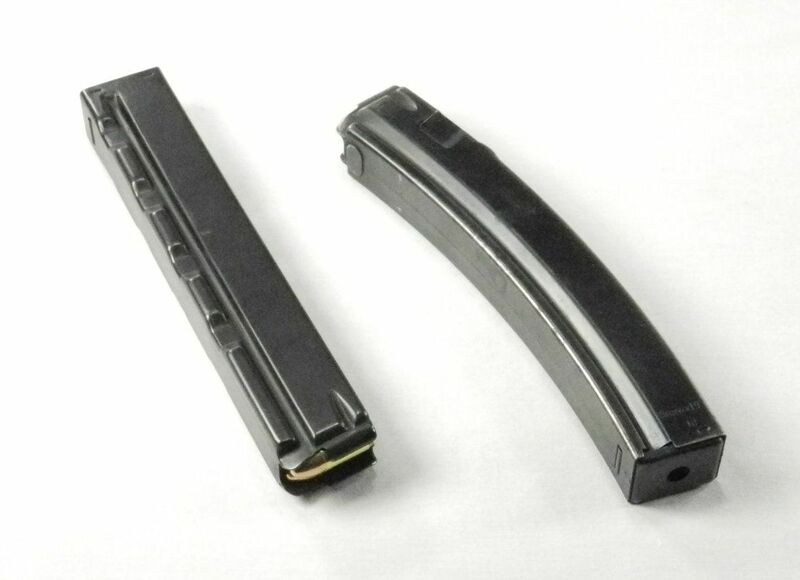 You might be able to buy these magazines at your local gun shop, but more likely you will need to go to hkparts.net. The 9mm Kriss Vector uses standard Glock 17 magazines that come in 10, 17, and 33 round variants. The criteria that we use to evaluate magazines for pistol caliber carbines are: 1) is it from the original gun manufacturer, 2) capacity, 3) condition – if it is used and 4) price. Although we live in a State that has kept the 1994 Assault weapons ban in place, since there are pre-ban magazines that fit the Kriss Vector, we can use both post-ban 10 round pre-ban and 17 round magazines manufactured by Glock. You should be able to buy these magazines at your local gun shop or you can go to midway.com. Magazines for the 9mm CZ Scorpion EVO 3 S1 carbine are made from a translucent polymer material and come in 10, 20 and 30 round variants. The criteria that we use to evaluate magazines for pistol caliber carbines are: 1) is it from the original gun manufacturer, 2) capacity, 3) condition – if it is used and 4) price. Since we live in a State that has kept the 1994 Assault weapons ban in place, the only magazines that we can use are the post-ban 10 round magazines manufactured by CZ since there are no pre-ban magazines for the gun since it was not available until 2016. You should be able to buy these magazines, and the 20/30 round magazines, at your local gun shop or you can go to midway.com. 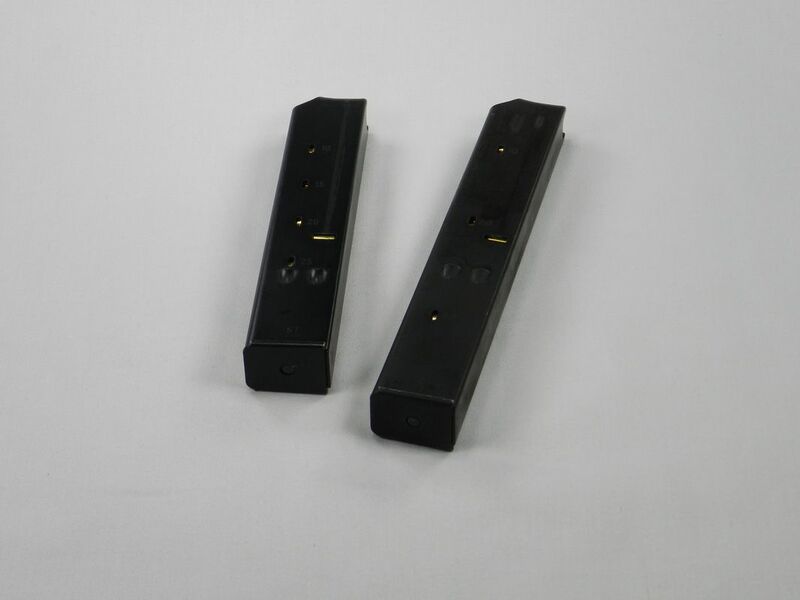 Magazines for the .22 caliber Smith & Wesson M&P 15-22 come in both 10 and 25 round variants. There are two versions of the 10 round magazines. 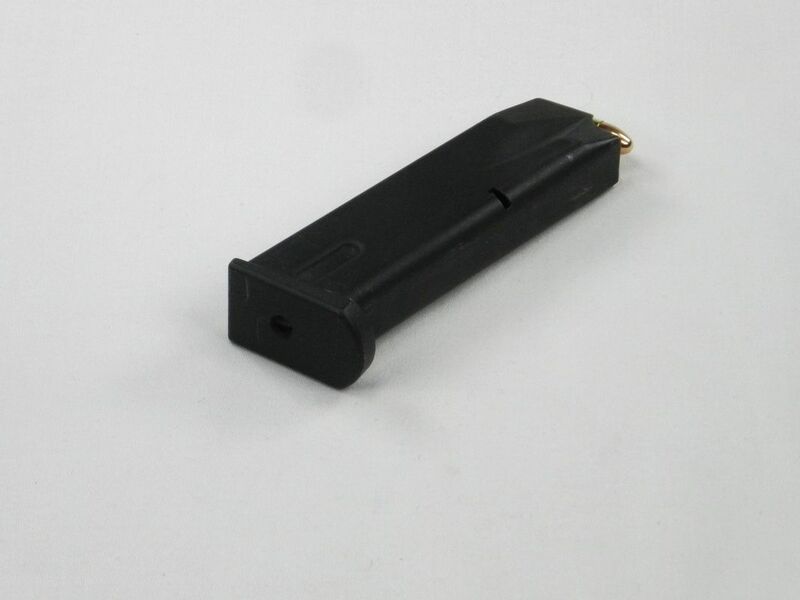 A curved 25 round magazine that has been stopped at 10 rounds and a straight 10 round magazine. The criteria that we use to evaluate magazines for small caliber multi-shot rifles are: 1) is it from the original gun manufacturer, 2) capacity, 3) condition – if it is used and 4) price. Because we live in a State that has kept the 1994 Assault weapons ban in place, and there are no pre-ban magazines that fit this firearm, all of our magazines are 10 round magazines (both the straight and the 10-round curved magazines) manufactured by S&W. You can buy these magazines at smith-wesson.com or your local gun shop.